Nothing we have experienced up until now quite compares with this. There is little that could prepare us for our journey through this collision of forces, aside from an emerging awareness that they are both external and internal manifestations. Manifestations of human and universal energies seeking to redefine and rebalance their shared essence. Consider for a moment the contribution that our own specifically ‘man made’ toxic cocktail makes to this confusion: electromagnetic smog; atmospheric aerosol pollutants; HAARP inspired weather engineering; leaking radioactivity from nuclear power plants; a highly destructive and continually active war machine; blanket agrichemical pesticide contamination of both air and soil; transgenic crops and animals; unprecedented number of highly contaminating oil spills/leaks; chemical assisted fracking for gas; pharmaceutical and industrial pollution of air water and food; and – not least – the dark side’s deliberate distortion of human energies and the mindless splashing around of these energies by its unaware recipients. The extremity of this multi-pronged violence enacted upon our living planet, its peoples, plants and animals, has led to the suggestion that humanity will pay the ultimate price and be wiped out. Destroyed by its own hand; its own uncontrolled hubris. Its failure to overcome its own blinkered shortcomings. Some say the World, battered and bruised as it is, will be better-off without man. That freed from its chief oppressor, Gaia will more assuredly survive and heal; will find her equilibrium anew and come through – restored. It is quite easy to sympathise with this view, not least because it seems to provide an answer to those who feel closer to nature than to their fellow humans – and can see no redemption for a mankind so determinedly set on the path of self destruction. Yet, even when taking into account the tragic mismanagement of humanity’s journey thus far, I do not consider this to be any kind of answer. For, it is my contention, that with man out of the picture, the advancement of universal equilibrium – however erratic – will be completely arrested. On the macro-cosmic level, I believe a world without human beings would constitute a major set-back for the entire universe. And at the micro-cosmic level, a major set back for the plant, animal and insect kingdom as well. Imagine for a moment the vast arena we call the cosmos. It is a vibrant intelligent life force. Intelligent, because it is at once self governing and on the move. It is in a state of permanent transition – never static. As it expands (and it still is expanding) it discovers itself … just as we discover ‘ourselves’ as we gain awareness and experience. We share with the cosmos a common intelligence which is without limitation, except in as much as it is held in check by counter productive forces of entropy. So humanity draws down unto itself the intelligence which is manifest in all elements of the cosmos. While standing behind that cosmic intelligence – and informing it – is the omnipotent, omnipresent source of Supreme Consciousness; a characteristic of which is an infinite creativity and unquenchable curiosity.. The intelligent cosmos is an expression of Supreme Consciousness’s passionate exigence. But the Supreme Consciousness cannot experience who or what He/She/It is until those exigencies solidify and take on form; offering a reflection of that which goes into them. Because it is in us that these Source based exigencies take on earthly expression. 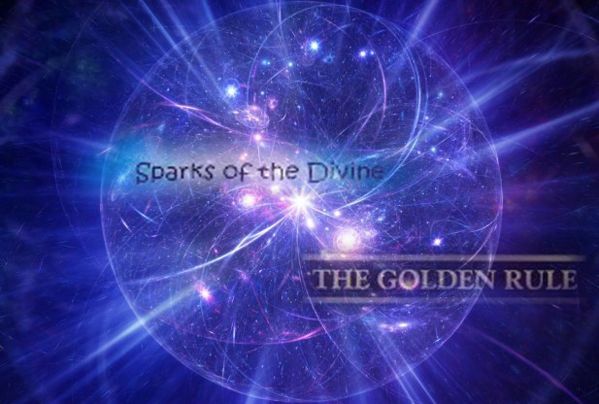 We are the earthly torch bearers of the Divine spark. It is in us that those Divine exigencies take form. And to the degree to which we earth bound beings in turn start sending back to the intelligent cosmos our own exigencies – expressed as love, joy, pleasure, pain – so Source gains greater or lesser degrees of awareness concerning (His) creation. In us, Source sees a third density reflection of (His) divine exigencies! But not in us alone of course. In every living being, rock, tree and sea – as they are all expressions of that same Supreme Consciousness. However, out of the great diversity of beings and matter that compose our planet, man has emerged as the best equipped to consciously recognise in himself – that infinite exigence which has its source in the Supreme Consciousness. Not only to recognise it, but to respond intentionally to its call: that pull we call ‘aspiration’. That wonderful upwardly reaching joyous impulse which is the inherent (unblocked) birthright of all humanity. Were this force to be wiped off the face of the planet – a great vacuum would be left in its place. For the plant and animal kingdoms cannot ‘consciously’ respond to the call of the intelligent cosmos, they can only act as reflexive recipients of its energies and act as mirror-like re-transmitters. Yet we see and experience in plants and animals a special kind of purity – because they are uncorrupted reflections of divine intelligence – and in this way – a permanent source of inspiration to homo sapiens. The plant and animal kingdoms do not have the free will and the evolved powers of self determination that humanity possesses. So should humanity be destroyed – or destroy itself – the plant an animal kingdoms would lose their stepping stones towards acquiring states of self determination and consciousness. Homo sapiens represents this stepping stone – the next rung up the ladder of cosmic consciousness for the animal and plant kingdoms. The fact that the great majority of mankind has so far failed to exercise its potential of cosmic consciousness is not a valid reason to conclude that it should be nullified. We humans provide a link between the Supreme Consciousness and all other living and animated features of Gaia. It is just a small minority who set out to deliberately distort that link – and set themselves up in its place as the false gods of engineered hubris. In our undistorted state, we are pulling on an invisible rope of which all living beings are attached. Next in line may be the dog which develops a strong affinity with its loving master/mistress. It maybe will have the chance to return to Earth as a human in the next spirit cycle. The courageous cat or the sensitized horse likewise, and so on along the chain. Even rocks will eventuality get their transformation chance. But, critically, only as long as all of life retains its spiral of forward and upward momentum – which it can only do if we humans fulfil our role in contributing our dynamic to that movement. Everything on that jostling, energetic chain of life is aspiring towards becoming an ever more subtle form of itself. We included. Continuously aspiring to once again become one with Supreme Source. Yet as the evolutionary energies move ever onward – and not simply in a repeating circle – that which we come from is itself also further evolving. What we yearn to return to is itself in movement, continuously evolving and metamorphosing. However its omniscient essence is retained throughout and will be instantly recognized as ‘home’. We humans occupy a pivotal point in all this. One which draws upon that which is below and aspires to that which is beyond. This places man in an unique position of responsibility towards the evolution of both Earth and Universe. We humans have inherited powers that, when used wisely and creatively, can positively determine the future direction of Life both on the microcosmic and macro-cosmic levels. And equally, when used unwisely and destructively, can retard that same evolution. That is our gift from Divine. We are entrusted with responsibility for this planet – and ultimately the entirety of universal evolution. We are even gifted with the potential to influence the ongoing composition of that which our Creator imagined into existence. The Creator does not cling to power as the delusional Illuminati do – but passes on the gift through us. Therefore, should humanity be erased off the face of this Earth who will carry on the great experiment? We are the ones to whom the baton of life has been passed and in whose hands its future rests. We are awaking to the realisation that ‘to be human’ means that we occupy a pivotal role in furthering the work of Creation. That is a gift which surpasses all other blessings with which we are endowed. So precious is it that we cannot but totally commit – and fully embrace our calling. And that means fully embracing the inclusivity of planetary diversity as expressed through all its multifarious species; the poverty or richness of whose lives is inseparably linked with the poverty or richness of our lives – and whether we are able or unable to fulfil the quest to realise that potential with which we are all endowed. So for the sake of that which we call Creation, mankind must come through. Humanity must prevail. This entry was posted on 4 September, 2014 in homepage and tagged Julian Rose, Man's Mis-management of Planet Earth, Philosophy, the future of mankind. Bookmark the permalink.